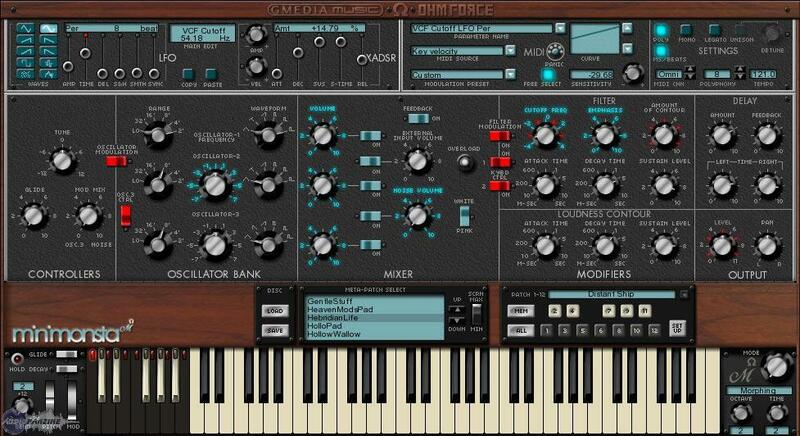 GForce Minimonsta, Virtual subtractive synth from GForce Software. The Mini Monsta is a virtual subtractive synth that sounds amazing and it really surprised me on how good the sounds actually where. It is very powerful and you can do all types of stuff with the sounds and you will have full control over how they sound. All of the sounds are really good quality and you can tell that the developers took time in developing the patches and wanted to put out a great product that we could all use for a long time. It is a very stable program, most Gmedia plug ins are and I have never had an issue with them and I have used them on so many different operating systems and from pc to macs. They always work great and so will the MiniMonsta. It did take some time for it to set up in my system though, a lot longer than I expected it to take. But after it finally got installed and all the patches where loaded then I started to mess around with it and no manual was needed to get started. I just had to get the feel of how to edit the sounds but it was the same as it is in most other software's. I have used it for years now and im not sure if they have upgraded it or not but if they havent that’s ok with me because I can keep using this and just keep changing the sounds and making them sound different every time. I have used the same preset probably 100 plus times and make it sound different every time then eq it a little bit and get it sitting good in my mix. I love it and it works for me, I am glad that I made the purchase and got this many years ago and still use it today. sonicsnap's review (This content has been automatically translated from French)" Much more than a simple emulation .."
Installation and Authorization easy and carefree. The Minimonsta is an emulation of the famous Mini Moog. That is basically a fairly simple synth. 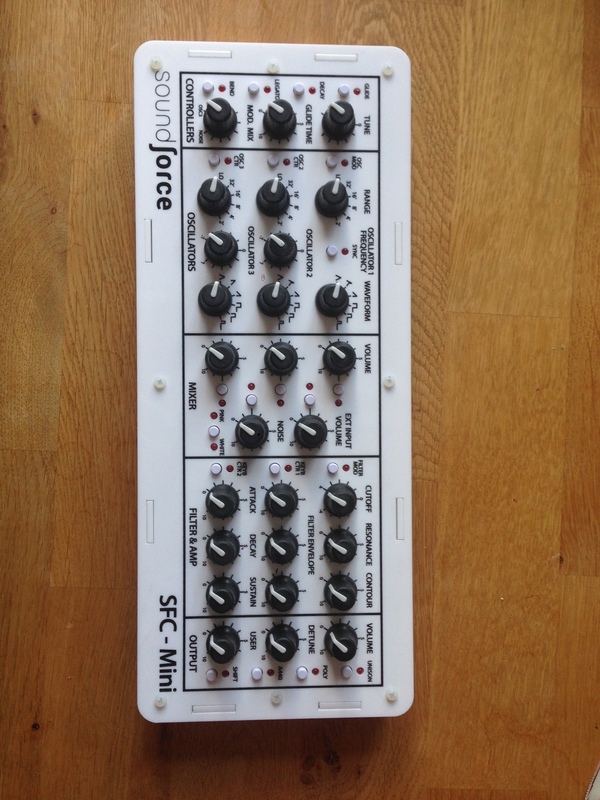 Three oscillators featuring six waveforms and the third can be used as an LFO. A white noise generator or pink. External input. Portamento. A resonant low-pass filter. ADS two envelopes, one for the filter, the other for amplitude. No release, the decay that can act. And it would be if we stood by the original model. But compared to the Mini Moog, the Minimonsta received some notable improvements. First section of modulation LFO and "XADSR." Almost everything can be modulated with the exception of the waveform and the "range" of the oscillators. We can even, for example, put a setting on the ADSR attack ads original, which does not really make sense .. But hey, who can do more can do less. All these parameters can also be controlled by noon. Moreover, unlike the Mini Moog was strictly mono, Minimonsta can be mono, legato, polyphonic (up to 32 voices) and this unison mode (up to 32 voices as well) détunable. Finally, a delay was added and synth benefits system "Melohman" that allows you to morph between the different presets. Finally add the Minimonsta is "delivered" with nearly 600 presets categorized by genre and all declined in twelve variants. 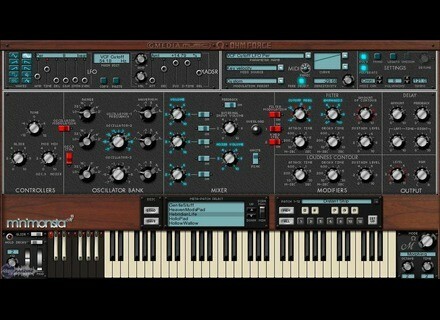 I have tested all: None duplicates, it gives an idea of ​​the immense horizons opened by this synth. It is also accompanied by a 30-page manual, French and very well done, which it is not necessary to do the trick. Never had any problems running on my Mac Pro, Mac OS 10.6.8 with Digital Performer. CPU usage is not excessive in current use. But if one dares to choose a 32-voice unison, then it explodes. On a new computer, but it goes on a less powerful processor can be saturated. Of course, you do not need 32 voices at all times. In my case, this is a truly exceptional cases. I use the Minimonsta now since many years. Despite having already had the opportunity to touch a Mini Moog, I am not able to say if the sound of this app is really close to the original. But I must say that this is the last of my worries. I have not acquired a substitute for Minimonsta Mini Moog at home, but because his sound, as it is, I was completely captivated. I think he excels in all types of audio, bass, leads, pads, etc.. The possibilities are extraordinarily larger than that of a simple Mini Moog. The added LFO can make sounds that move in every direction. The unison allows sounds thick and grandiose. Strictly speaking, all that I regret is that a release has not been directly added to the ADS of origin, even if the additional XADSR can largely circumvent the problem. For me, even if the Minimonsta not reproduce perfectly the sound of the Mini Moog, it exceeds its model in many respects. 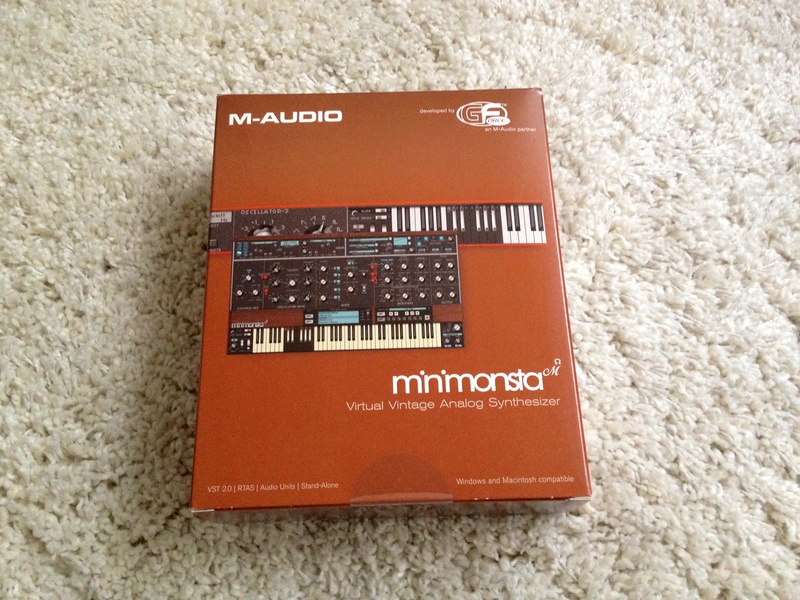 It is a very versatile synth find its place in all kinds of musical styles. I miss a lot if I had more.